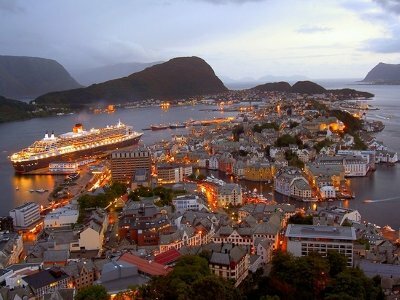 Book now the best shore excursions in Alesund. High quality and safety at the lowest prices. If your are looking for Shore Excursion Alesund, book now the best guided tours at lowest price with Ancora Tours. Since 2003 we offer you official guides in english, transportation and travel insurance, all included. The highest quality at the lowest rates. Distinguished by its numerous spires, towers and highly detailed ornamentation, Alesund is a town renowned for its beautiful Art Nouveau architecture. After a devastating fire which destroyed a big part of the city in 1904, the town was rebuilt in the fashionable style of the that time. Join us and fall in love with the Art Nouveau during our shore excursion in Alesund! What’s eating: Rakfisk; salted and fermented trout. The fish is treated for two to three months, or even up to a year, then eaten without further cooking. Souvenir: Forget Belgium or Swiss chocolate, Freia Brand chocolate is really delicious and a great gift! Dress Code: Comfortable boots or walking shoes. A raincoat or umbrella, waterproofs. Generally warm clothes, with hat and gloves, sunglasses. The Alesund shore excursion first passes through the fishing port of Brosundet, where we’ll see the picturesque Apotekertorget square. Don’t forget your cameras; the fisher boy statue that looks over the water makes for a great snap! Next we head to Sunnmøre Museum, a collection of over 50 traditional buildings from the 11th to the 16th centuries. Look out for the impressive Viking ship replica. The Alesund shore excursion finishes at Aksla Belvedere. From this viewpoint there’s a spectacular view of the town amongst the backdrop of the coast and Sunnmøre Alps. Alesund is also famous for hosting the Norway Food Festival, so be sure to taste some specialties while you’re there. We recommend reindeer and moose meat, as well as the plentiful fresh fish. Smalahove; boiled or steamed sheep’s head is not for the faint hearted.